Once there was a man whose prison was a chair. The man had a monkey, they made the strangest pair. And now as fate would have it, one of them is dead. Dude. I can really use a Monkey. What the hell? A creepy toy monkey AND rhyme that pretty much told you the plot? YES PLEASE. As I’ve mentioned in previous FEARtastic vaults, I was an easy sell as a kid (probably easier now as an adult) when it came to renting horror flicks; pull me in with your cover and I’ll give you a watch. 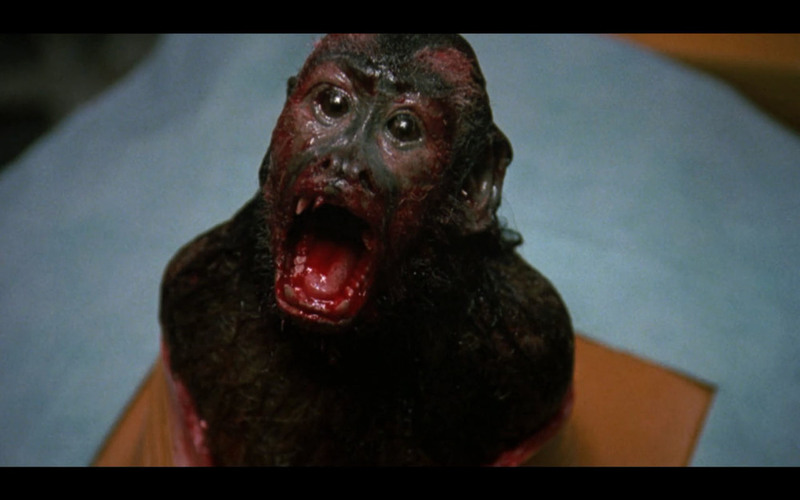 Animals have never been a stranger to the horror genre but the idea of a smart helper monkey running amok had an entertaining premise that elevated this movie into an entertaining romp. The role and responsibility that horror movies give to our society is taking the arbitrary and giving them a creepy spin so that we will think twice when trying to lead our normal lives. Pets to me are the most obvious target because their love is something that most folks see as natural so when the horror genre sets to make you think twice about an animal’s loyalty, it makes the movie that much more entertaining…or creepy. I got me a Monkey! Monkey Shines follows a former athlete, now a quadriplegic with a depressed outlook in life when he receives a helper monkey named Ella. The duo creates a strong bond with each other that takes a turn for the worst as the bond is much more than simple affection. A sort of telepathic link begins to compel the monkey to act on her master’s ill will towards others that turn into a string of gruesome murders. You see? Although the poem on the cover pretty much gave away the plot, I really didn’t care because this movie offered an animal going on a killing rampage JUST AS the poster suggested. Nothing more, nothing less. The simplicity of that feat was an entertaining was as well so as a horror fan, I had little to complain about in this department. Hmmm, this monkey may be violent. Okay, this monkey is DEFINITELY violent. AND she’s a junkie, holy smokes! 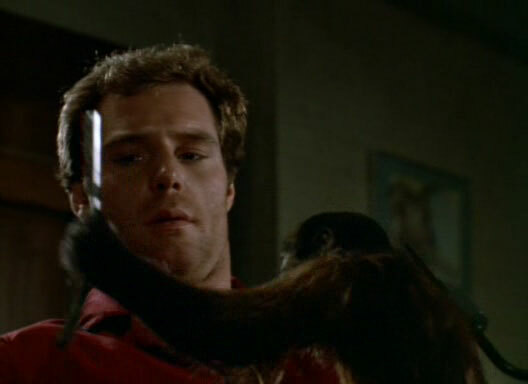 The interesting character point that made this movie interesting is that the main character was not in a position to run away from the killer (monkey). 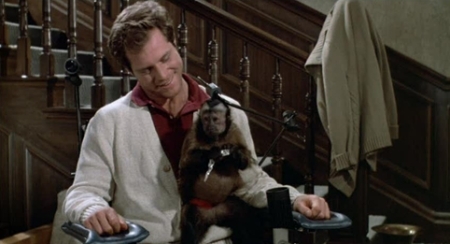 Since the character was a quadriplegic, it gave an interesting twist once the main character found out that his monkey was an instrument of death. 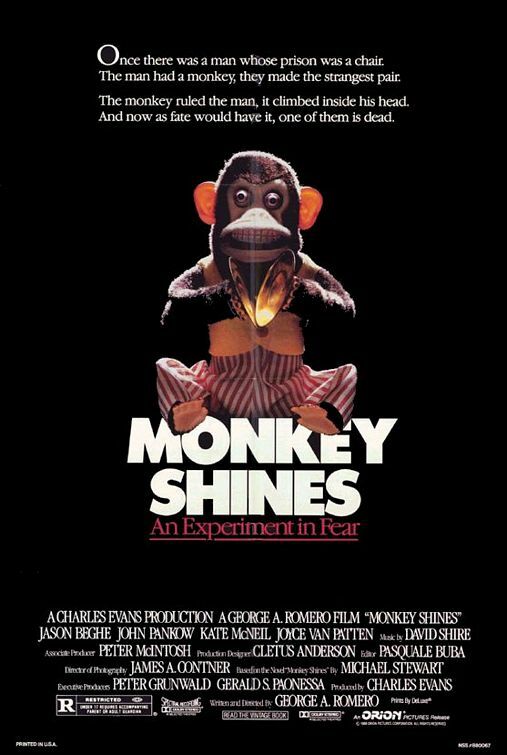 A surprising turn for this flick was the emotional element that the movie spent a lot of time building up between the monkey and the main character. There was definitely some emotional groundwork that this movie laid down so that when the decision was made that the monkey had to be put down through betrayal, a part of me did feel bad for the monkey which had to be put down from the one person she loved most, her master. I say surprising because if you were to tell me I would have a moment of sadness in a horror flick involving a helper monkey, I would have been confused. For all you animal lovers, take this flick for a spin for the sake of seeing how man vs animal can be something tragic in an entertaining horrific way!